Yesterday I ordered my Core i7 4790K CPU. It should arrive within today. Amazon says that they have already shipped the item. Hopefully it will arrive before nightfall. In the mean time, I decided to update the firmware of my Maximus VI Hero motherboard. It already had a version of firmware that supported Devil's Canyon CPUs - version 1402. But as it was a beta firmware, and as there was a newer non-beta firmware available - version 1505, there was no reason to stick to what the board currently had. Updating firmware on Asus boards - even in the year 2014 - is a tedious task. The actual updating process is quite simple. But the CMOS settings will be lost forever with it. If one knew how hard it is to overclock Haswell CPUs, these custom CMOS settings can be invaluable. Hence, they need to be saved somewhere, so that one can get back to those settings after updating the firmware. 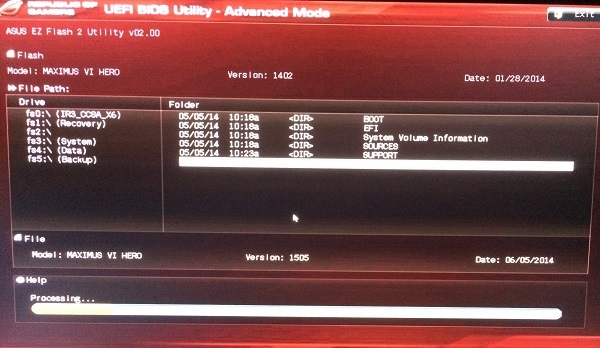 There indeed is a feature built into Asus UEFI, where the CMOS settings can be saved to a USB flash drive. This feature doesn't really work as expected. Both versions of the firmware - the one original settings are from and the one the old settings are loaded on to - have to be same. This makes it completely useless to an individual. The real purpose of this feature could be to share settings at an overclocking event. While I knew the settings by heart, I wanted to be on the safe side and decided to save the settings anyway. Saving the settings means, capturing the many pages of the UEFI and storing them as images. It can be done by plugging in a USB flash drive and pressing the appropriate key - F12, if I recall correctly. This part was easy, as I have one of the two USB drives - the larger one - plugged into the motherboard at all times. This USB drive is used for installing Windows 8. At first I expected the UEFI not to recognise the filesystem as it is using NTFS, but it admirably did. It made things much easier, as I didn't have to plug in the other flash drive which is formatted using FAT32. Before updating, I didn't forget to reset the CPU overclock to the stock settings. I doubt it is required, but I didn't want any trouble. The firmware updating process didn't take long. Just like the previous occasions, the PC went into a 5-reboot-cycle and finally came to life. I'm sure that people who are experiencing this behaviour for the first time, must have almost got a heart-attack. While I wasn't that worried, as this is not the first time I was experience such behaviour, I wasn't 100% confident that nothing went wrong. But fortunately, nothing did. Now it was time to start the count down time ETA.. While Amazon doesn't make any bold claims, I was hoping that the CPU would arrive in the next morning as I ordered the CPU in the evening.